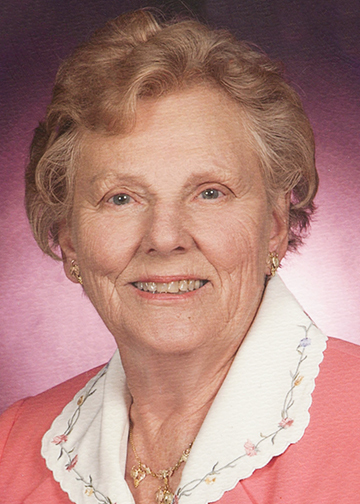 Lillias Boudion Ebner, 96, of Beaumont, died on Thursday, April 4, 2019 at Harbor Hospice, Beaumont, surrounded by family, friends, and caregivers. Born in Abbeville, LA to Leonce and Philomene Boudion, Lil (as she was known to so many) spent her childhood in Kaplan, LA. She graduated from Hotel Dieu School of Nursing in Beaumont as a Registered Nurse in 1942. Later that year she married Adolph “Eb” Ebner, Jr. Lil served as Staff Nurse for Mobil Oil Corporation in Beaumont. She was also a member of the St. Elizabeth Volunteers. Together with her husband of 58 years, Lil and Eb established Ebner Rice and Cattle Company, a 1500-acre rice farm north of Orange. In later years, they ran a successful saw mill, Ebner Tie & Wood, in Devers. When they were not raising crops or sawing wood, the Ebners went traveling the world. Lil was a faithful member of First Presbyterian Church, Orange, and later, of St. Andrew’s Presbyterian Church in Beaumont. Lil was a life-long learner and a keen observer of life around her. She was an active member of The Grace and Men’s Sunday School class, the Monday Morning Bible Study class, and the TAG Group. As a member of Presbyterian Women, Lil served for years as one who thrived on visits with the homebound and hospitalized. She wrote cards and letters, delivered flowers, and supported the monthly Communion ministry at Calder Woods. She enjoyed the weekly gathering of women and men who assembled and addressed the church newsletter, and also the lunchtime meal afterwards. Her faithful nature was evident in her love for God and for her family. Her grandchildren and great-grandchildren called her Nannie, and she glowed in their company. Lil was a natural caregiver and a generous friend. Her kindness, wit, and sense of good humor was legendary among her friends. Lil enjoyed growing roses, exercising through water aerobics and daily walks, gathering with friends, speaking French, and especially dancing to the music of the Big Band era. She kept her promises, fulfilled her commitments, and accepted folks for who they were. Generous was she in giving, and humble was her soul. Lil Ebner is preceded in death by her parents and her husband Eb, her sister Laura Broussard, and great-granddaughter Adalyn Thibodeaux. She is survived by her three sons, Reggie (Gail) Ebner of Aiken, SC, Rudy Ebner of Mauriceville, and Bennett (Kay) Ebner of Rye; her grandson Quentin (Kimberly) Ebner; her granddaughters Erin (Brandon) Thibodeaux, Lorna Ebner, Leah Ebner, and Lyndsey Ebner; five great-grandchildren, Katelyn, Jacob, and Cooper Ebner, and Aubrey and Grayson Thibodeaux, as well as many nieces, nephews, and countless friends. The family sincerely appreciates all the love and support shown by the staff and congregation of St. Andrew’s church during Lil’s many years as an SAPC member. The family also extends heart-felt appreciation to those who have served as Lil’s caregivers over the past two years: Nelda Ledezma, Dana Allen, Tina Bobo, Kajasmine Copeland, Carolyn DeRouen, Janie Gifford, Murlon Haynes, Anne Ochoa, and staff at Synergy HomeCare. A gathering of Mrs. Ebner’s family and friends will be from 5:00 p.m. until 7:00 p.m. Monday, April 8, 2019, at Broussard’s, 1605 North Major Drive, Beaumont. Her graveside service will be 10:30 a.m., at Magnolia Cemetery, 2291 Pine Street, Beaumont, followed by a Service of Witness to the Resurrection held at 12:00 p.m., Tuesday, April 9, 2019, at St. Andrews’s Presbyterian Church, 1350 North 23rd Street, Beaumont. Memorials contributions can be made to St. Andrew’s Presbyterian Church, 1350 N. 23rd St., Beaumont, Texas 77706. Although it's been many years since we've visited, I have many memories of your mother and dad. Our thoughts and prayers are with you and your family as you celebrate your mother's life. We can understand what you're going through right now since our mother Helen Heiner joined Daddy in Heaven 12/30/2018. Share and enjoy the memories. God's Blessings. Rudy, Quentin and Family, I am so sorry to hear of your loved one's passing. I did not realize that Miss Lil was kin to you. What a sweet, kind, sensitive Lady she was. I remember how my Moma and she would discuss their days at Hotel Dieu. Moma trained in New Orleans and they always enjoyed their chats whenever Miss Lil would see her at the hospital. Whether there for treatment or visiting a patient, Miss Lil always wanted to help Moma and Daddy where they needed to go! I know that you will be reminded of some many wonderful things that she did for everyone! Please let those wonderful stories and memories overshadow the pain and loss that I know you are feeling. Miss Lil comforted so many families feeling exactly what you are right now. To the Ebner Family: Our sincere condolences to you all in the death of Mrs. Ebner. Heaven surely has another angel. We have fond memories of her and the rest of your family at First Presbyterian Church. May you be comforted with your memories and the faith that sustained her. Mrs. Lil gave me a pair of Kidd gloves for high school graduation in 1967. I still have them displayed in my home. May God bless and keep you all in His care.